On June 3, 2015, May Class and Component Prices were released. Class III milk prices were up again due to an increase in cheese and butter prices. 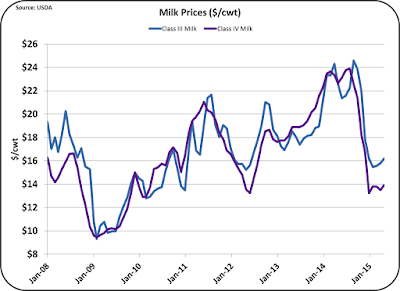 The Class III milk price was $16.19/cwt., up 2.4% over the prior month. 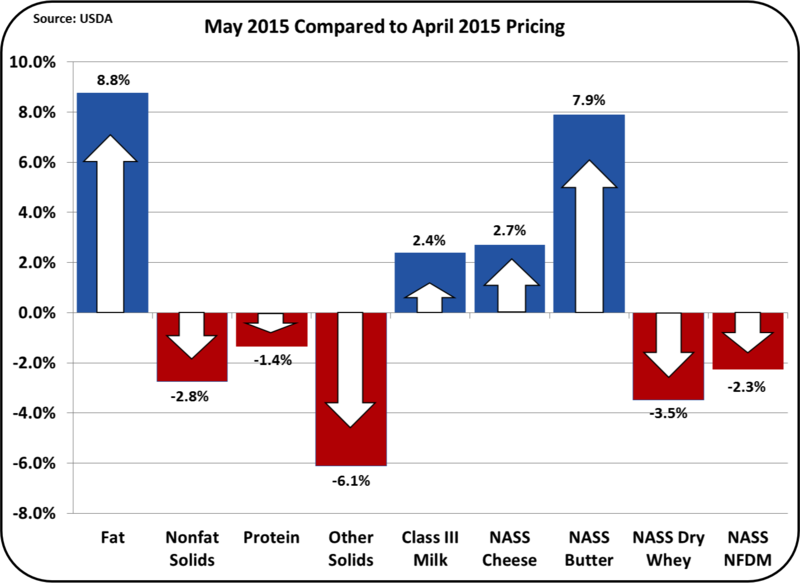 Butterfat was up 8.8% with the strong price increase for butter, but milk protein was down for the same reason. For the mathematical basis of these calculations, see the August 8, 2010 post to this blog. 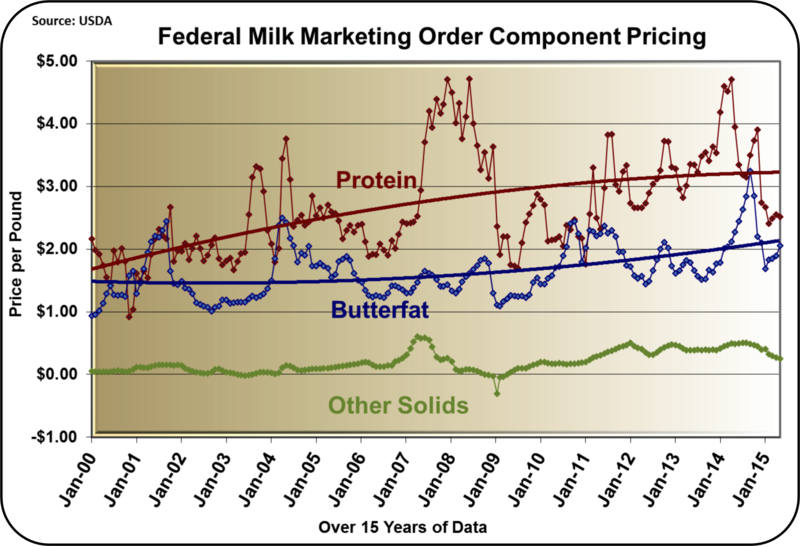 For some time, this blog has predicted a drop in butter and butterfat prices. The high exports in early 2014 created tight inventories, but these low inventories and resulting higher prices were expected to be corrected with increased churning. However, churning has not increased in spite of higher prices and inventories remain slightly tight. More on this is discussed below. 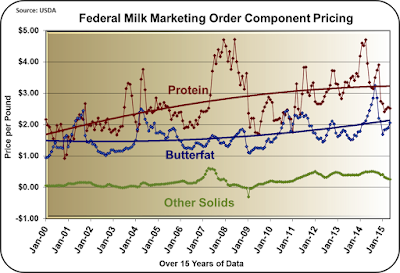 The value of milk protein was down slightly and continues to be well below the long-term trend line. Other solids were down as the value of dry whey was down. Other solids at $.25/lb. are at a five year low. The value of dry whey is determined primarily by international markets, which are currently weak. The values of the three paid components, which add to the Class III price, is shown below. The contribution of other solids is down to 9% of the milk check. While milk protein still contributes the most to the milk check, the real news is the 44% contribution from butterfat. 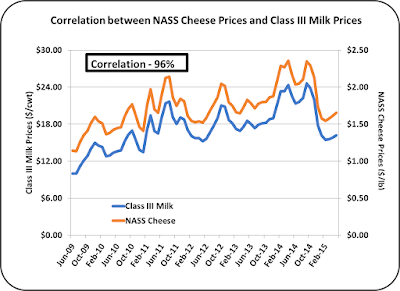 Typically, cheese is discussed first because of its tight correlation to the Class III milk price. 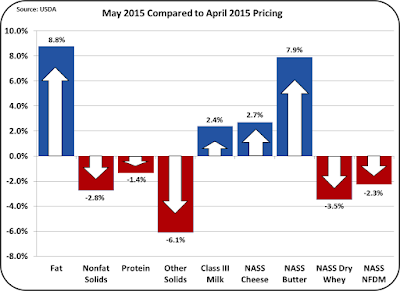 However, the most dynamic variable in May was the butter price, so it will be reviewed first. 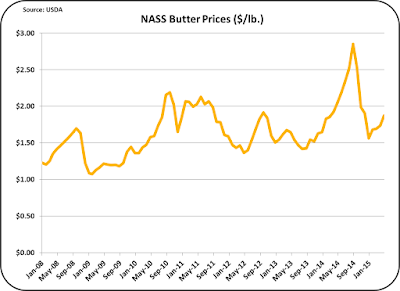 In May, the NASS price of butter was $1.87/lb. 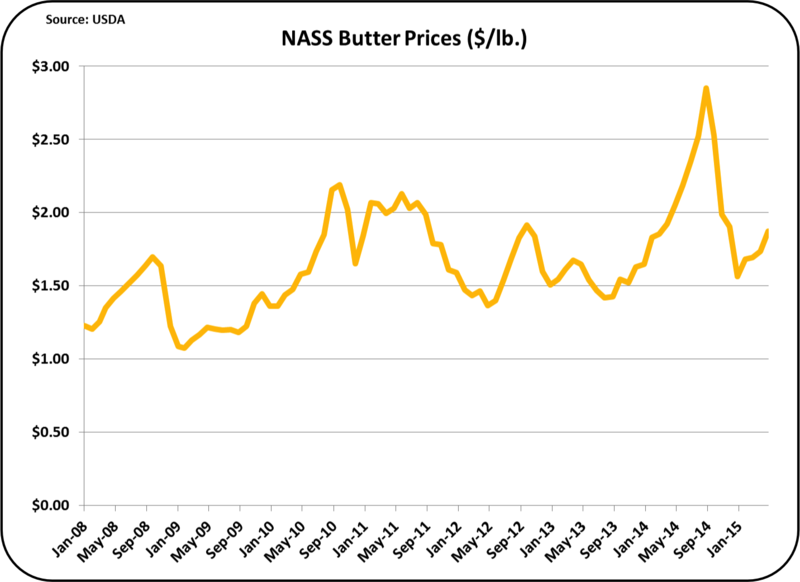 Prior to 2010, butter prices were typically in the $1.00/lb. to $1.50/lb. Since 2010, the price has ranged primarily in the $1.50/lb. to $2.00/lb. range. The spike to $2.85/lb. in September 2014 was an abnormality, but the higher price range since 2010 has been running long enough that is it difficult to call this an abnormality. 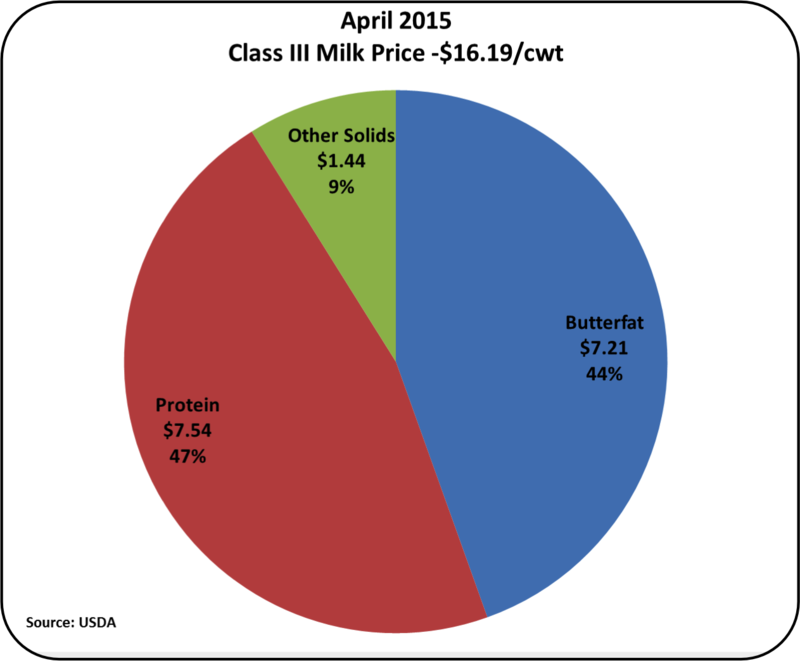 It seems that butter, and therefore butterfat, have found a new and increased value. Surprisingly, butter churning has not increased. The five years shown below are nearly identical. The higher prices have not increased churning. 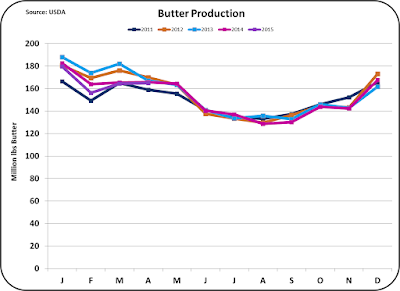 As shown below, production of butter has remained nearly constant for the last five years. 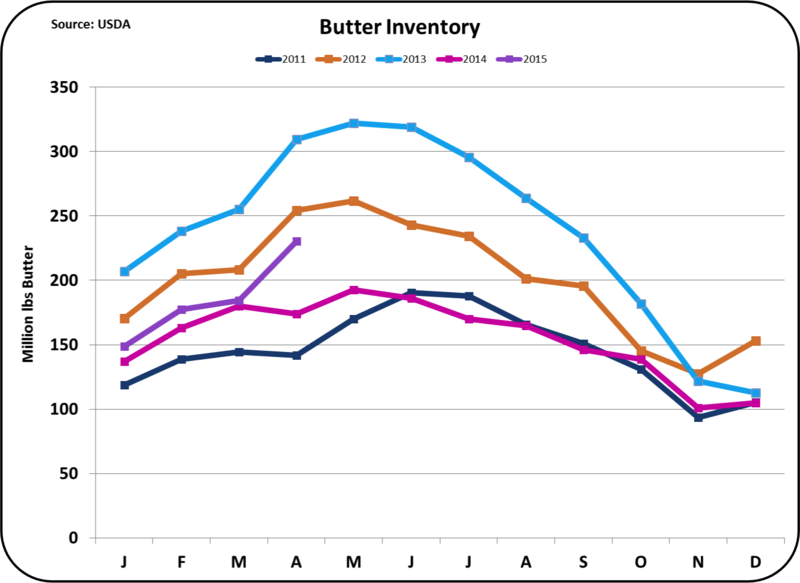 Butter inventories had some highs in 2013 and some lows in 2014 caused by export fluctuations. 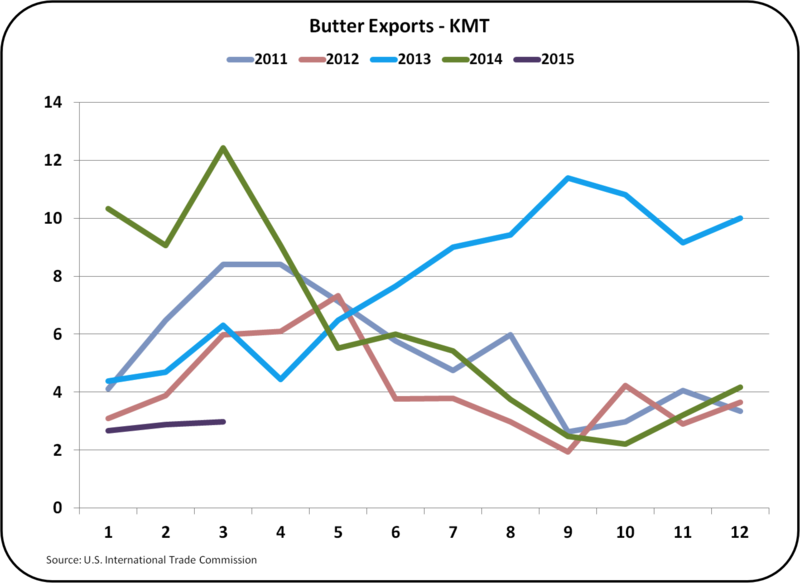 See the May 10, 2015 post this blog for more details on butter exports. 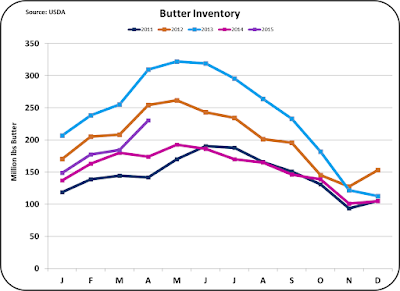 Currently butter inventories appear to be in line with historical levels. That would indicate that the current price of $1.87/lb. 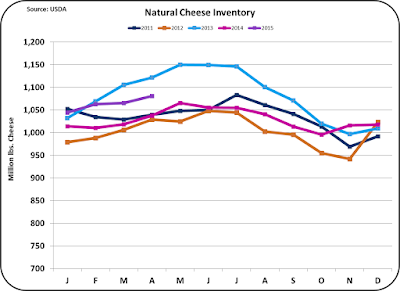 is a normal price in today's dairy environment. 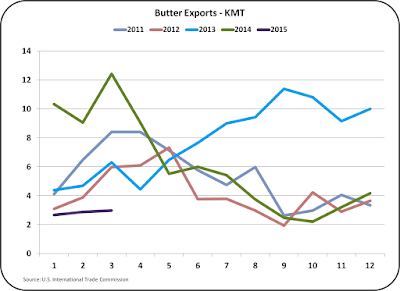 Butter exports which were covered in the prior post, are shown again here to emphasize that the current inventory levels have no room for exports. Exports for 2015 are almost non-existent. Butter usage remains limited to domestic disappearance. 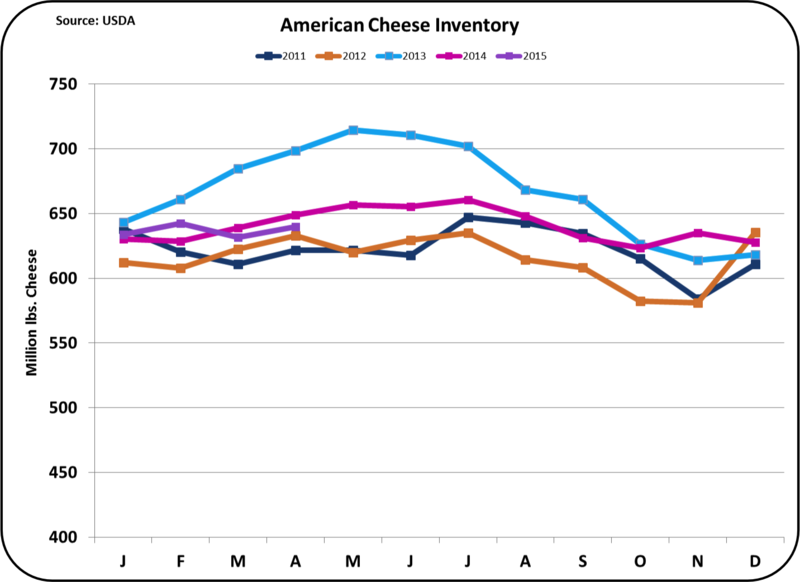 Cheese production is up, consumption is up, exports are strong, and inventories are in line. 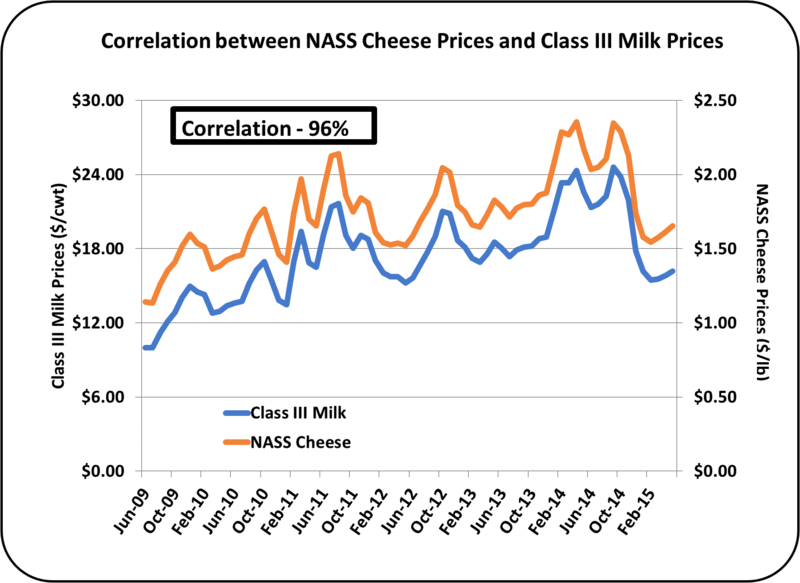 Cheese pricing is the most important variable in the calculation of the Class III price and the two values have a 96% correlation. See the April 23, 2009 post to this blog for more details on this relationship. 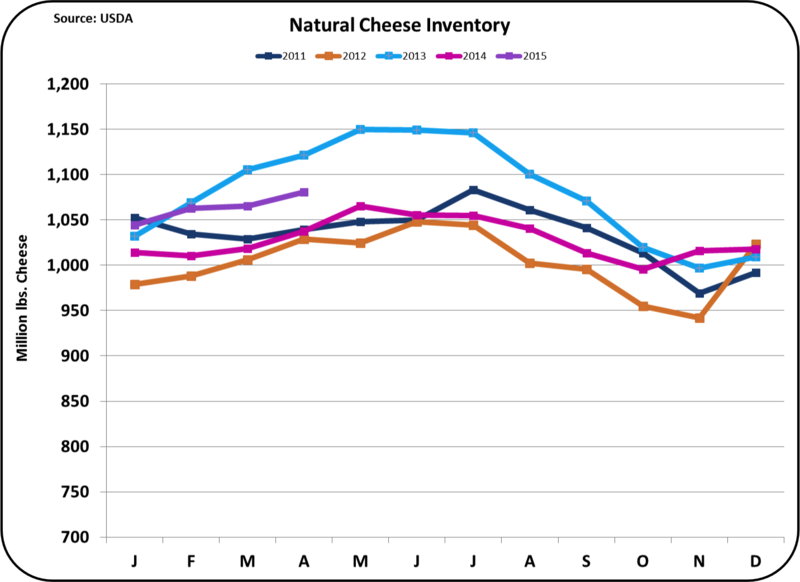 Cheese was up in May, and so was the Class III price. Nonfat dry milk has a domestic market as well as an export market. Whole milk powder is strictly an export item and has for that reason it has gathered very little interest from U.S. processors. However, this appears to be changing. 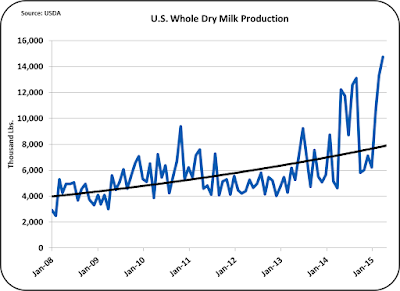 Below is the chart of whole dry milk production. Because whole milk powder with butterfat can easily become rancid, special packing is required to minimize the availability of oxygen creating another barrier to entry in processing whole dry milk. Whole milk powder prices are not used in any of the producer milk pricing formulas. However, by increasing demand for milk in general, it could have a favorable impact on overall milk demand and stress the availability of milk for other uses thereby increasing milk prices. The growth of this market is important because the international whole dry milk market is significantly larger than the nonfat dry milk market and the growth of production and export of whole milk powder could be another major game changer for the U.S. dairy industry. Because nearly all of the whole dry milk is exported, this growing market favors California producers. 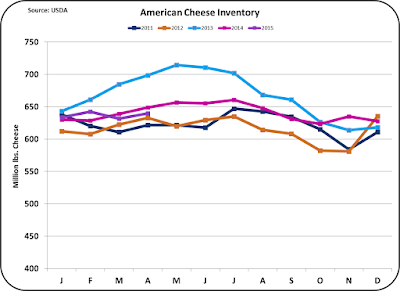 However, by bringing additional demand for milk in California, it may shift some cheese production to the strong and low cost upper Midwest area. 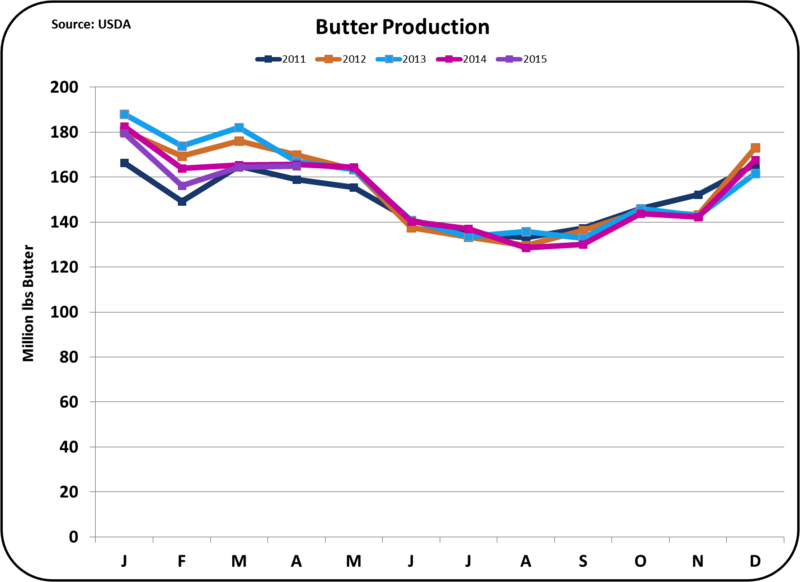 This may also put additional pressure on butterfat availability in California, which is the largest butter producing state. 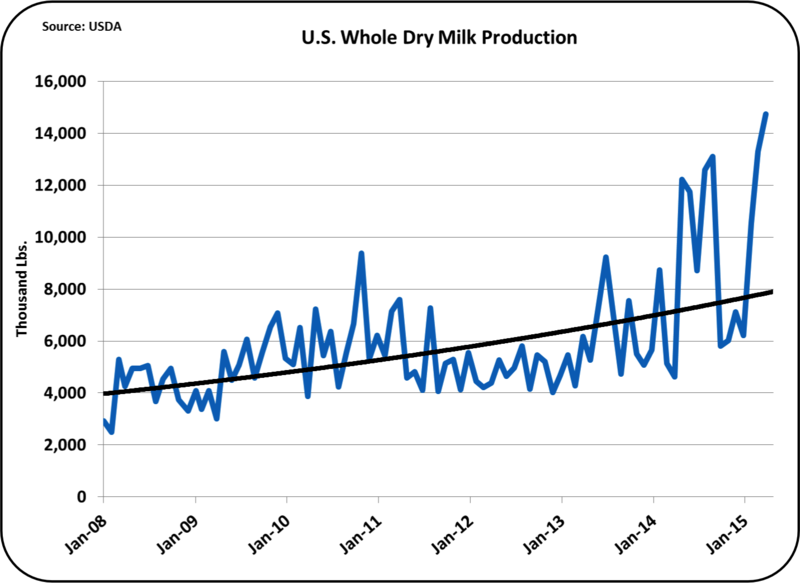 At the current production levels, whole milk powder production is approaching a level roughly equivalent to 10% of the nonfat dry milk production. However, because basically all of the whole milk is exported, and only about half of the nonfat dry milk is exported, that comparative ratio of exports of the two products could significantly alter the profile of dairy exports. Today, nonfat dry milk is the largest volume dairy product exported. This potential market change will continue to be followed in this blog.